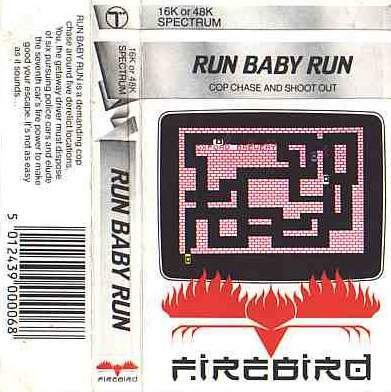 Run Baby Run is, without doubt, the greatest game ever created. FACT. Better than other so-called “best games” like Half-Life, Mario 64 or Halo 3. LAW. I have spent more of my life playing this game than any other game. I play it almost every week. I even bought a flash cartridge for my Game Boy Advance so that I could use a Spectrum emulator on there and play it on the move. So, it is only right that I collect together everything RBR and put it here. 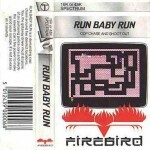 The main aim of Run Baby Run is to drive around the levels, causing the trailing police cars to crash into one another. Each of the cars follows where you drive exactly, except they don’t stop when you do. Use this to drive looping pathways where cars will collide with each other. Once all the following cars are gone, the final car will drive left and right along the bottom of the screen shooting away the scenery. Drive to the bottom of the screen without being shot to finish the level! There are five screens in all, and you play all five even if you fail. However, for each level you complete, you get an extra level after the first five – although it is just the levels wrapping around over and over. Note that your car also speeds up constantly, even when you complete a level! The game only slows down if you crash. The emulator used is Qaop. I didn’t think anyone else like that existed! Great game- can’t someone do a similar app?